AAMA Testing & Compliance | Ultrafab, Inc.
Ultrafab proudly adheres to and exceeds all AAMA 701/702-11 specified requirements for Pile Weatherstripping and Replaceable Fenestration Weatherseals. We maintain a strong presence as an AAMA member for over 30 years and continue to play an evolutionary role in the continuous development of new voluntary standards and guidelines for the Fenestration industry. 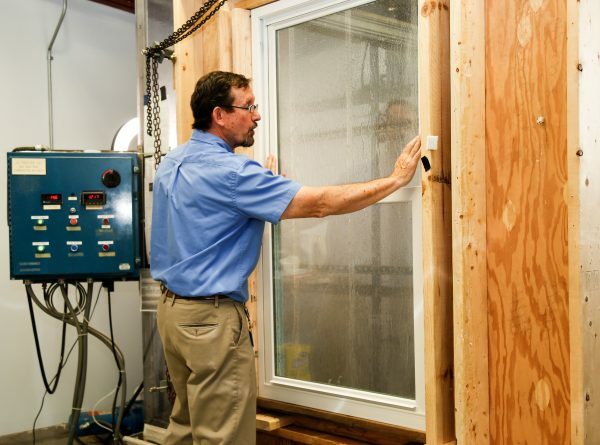 Window or door system optimization is the utilization of testing methods and laboratory equipment to determine the performance of a fenestration system and the components within. Optimization can assist by performing “trial and error” on your fenestration product PRIOR to certification via 3rd party (i.e. independent test facility). How can Ultrafab assist with my fenestration product? Ultrafab allows full use of our air and water test chamber for any customer. The test chamber allows for a fenestration product to test for both air and water penetration and resultant leakage. It is critical to understand the performance of a fenestration system and its vulnerable points PRIOR to certification. Performing optimization during certification can be extremely expensive and time consuming. Ultrafab can “defray” these costs by assisting with design issues and making recommendations to improve system performance based on testing results. If my company has its own air and water test chamber, why should I utilize Ultrafab? We hear this quite often. While many companies do, in fact, have their own testing wall chambers, it can be difficult to keep every possible weatherseal readily at hand for trial and error. Ultrafab has multitudes of seals awaiting testing in your application at any time to assure that maximum sealing is obtained by use of the CORRECT weatherseal EVERY TIME! Ultrafab will set up and test your fenestration application in our state of the art air and water chamber. Ultrafab will trial seals and gaskets of all styles in every location to obtain maximum sealing performance. Ultrafab will provide a test report FREE of CHARGE indicating before and after results, what locations certain sealing products were used and any additional information to assist you with your design. Ultrafab will provide onsite support during 3rd party certification upon request and will make arrangements to have our tested unit sent directly to the independent lab. Ultrafab will invite you to be present at our facility to view your testing in progress to better learn and understand the application and how it is performing. Let Ultrafab assist you with your product performance. Download our free resource to learn more about the value of pretesting your product to ensure AAMA certification faster and at lower cost. Take advantage of Ultrafab’s value-added service, our free-of-charge test lab, to perform a variety of tests on windows, doors, and sub assemblies. Ultrafab’s state-of-the-art test lab conducts pre-certification air and water testing, and has QUV and Xenon Arc weathering capabilities to test for long-term exposure issues. By testing our customer’s existing fenestration products, then re-testing the products using fenestration products recommended by Ultrafab’s applications engineering team, our customers are able to achieve the best possible performance for their windows and doors. In most cases, performance is increased by 25% or more. By pre-testing, customers save time and money. Through use of the Ultrafab Test Lab, our customers get the help they need to get their product to the desired performance rating prior to spending money at certification test labs. The Ultrafab Test Lab supports a wide range of testing protocols and follows procedures and methods outlined by industry standards organizations, including: AAMA, ASTM, WDMA, and CWDMA. Contact Mark Sennett at msennett@ultrafab.com to review your design and start testing TODAY!